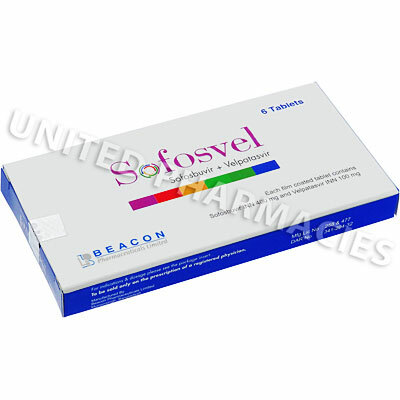 Sofosvel is a pan-genotopic treatment for Chronic Hepatitis C (HCV), meaning it can be used to treat chronic HCV genotype 1, 2, 3, 4, 5, or 6 infection. It is a fixed-dose combination of sofosbuvir (a hepatitis C virus (HCV) nucleotide analog NS5B polymerase inhibitor) and Velpatasvir (an HCV NS5A inhibitor). Sofosvel comes in a pack of 6 tablets. Each tablet contains 400mg of Sofosbuir and 100mg of Velpatasvir.